Objective: To determine whether differences of angles between the alar rim and the long axis of the secondary defect in a Zitelli bilobed flap affect alar displacement in a fresh cadaver model. Methods: In fresh cadaver heads, identical, unilateral 1cm circular defects were created at the superior alar margin. Three different laterally based bilobed flap templates for reconstruction were used. One template, used on 3 cadavers, had an angle of 60° between the alar rim and the long axis of the secondary defect. Another template, used on 3 cadavers, had an angle of 90°. The last template had an angle of 135° and was used on 2 cadavers. Photographs were taken before the repair and after with the camera and cadaver heads in the same spatial relationship to each other. Results: In the 3 cadavers that had repair using an angle of 60°, all cadavers experienced alar retraction, with a mean displacement of 1.3 mm. This was not a statistically significant change (P =.07). In the defects that had repair using an angle of 90°, there was also no significant alar displacement (P =.72). In the 2 cadavers that underwent repair using an angle of 135°, both ala underwent depression by 1.0 mm. When the differences achieved between the different angles were compared, there was a significant difference in measured distortion between the cadavers that had 90° and 60° vector placement (P =.02). There were no measurable changes to the contralateral maximal nostril distance. Conclusions: Vector alignment can have an impact on nostril displacement. In bilobed flaps, the axis of the secondary defect may play an important role. This study suggests that secondary defects aligned perpendicular to the nostril have the least amount of alar distortion. To ensure a safe blood supply, the width of the second flap should approach the width of the first. Although Esser1 described the second flap as having the same size as the first, this is not necessary. The first flap is usually larger than the second.1 Undersizing the primary or secondary lobe will result in increased tension, which leads to alar distortion. Cho and Kim5 attributed this to excessive tension on closure of the primary lobe and distal defect due to a tethering at the base of the pedicle. By increasing the length of the primary flap by 10% compared with the standard design, Cho and Kim5 demonstrated in fresh cadaveric specimens that a markedly decreased amount of distortion can be attained. Zitelli6 responded to this study with a recommendation that a longer flap is necessary only when there is skin that is too tight for rotation of the flaps and closure of the secondary flap donor site. This type of situation exists at the immobile skin of the inner canthus, where there is little loose skin. Oversizing of the flaps may lead to trapdoor deformity and uneven contours. In cases of thick skin, the primary lobe should be the same size as the defect owing to limited ability to stretch the primary lobe. The angle between the alar and the long axis of the secondary defect is demonstrated using red lines. The outline of the repair design is drawn in black. This is an example of the prerepair measurement. At the nostril, a line is drawn from the anterior aspect of the nostril to the posterior aspect. The short black line is the point of maximal retraction, placed and measured perpendicular to this line. This is an example of the postrepair measurement. The bilobed flap has a high flexibility of flap design variation and tissue movement. Esser1 stated that the angle of tissue transfer had to be 90°. However, subsequent authors7 have found that the angle can be decreased significantly to suit the situation. The chosen angle has effects on tension vectors. The direction of vector alignment plays a central role in alar retraction. The secondary lobe may play a larger role in alar displacement than previously thought.8 Closure of the secondary donor site involves tension. The vector of this tension can vary depending on the angle between the axis of the secondary lobe and the alar rim. Different variations of the angle exist, with most falling between 60° and 135°. If the sum of forces has a vector component that is perpendicular to the long axis of the ala, this will act to either retract the ala cephalically or displace it caudally. However, if the sum of vector forces is parallel to the alar rim, the tension should have no effect on alar position in a rostral or caudal direction. To our knowledge, no previous study has evaluated vector alignment’s effect on nostril appearance. Our objective was to determine whether differences in this vector alignment affect the degree of alar distortion. Eight fresh cadaver heads were obtained. Using a 1cm circular template, standardized 1cm circular defects were created in the same location in each cadaver head. The fullthickness skin defect was placed with its center at the superior alar margin (Figure 1). Each cadaver’s nose was limited to 1 defect. Three different templates for reconstruction were used. Three defects (on 3 separate cadavers) were repaired with a template that had an angle of 60° between the long axis of the secondary lobe defect and the alar rim. Figure 1 demonstrates the repair outline from this template. Three defects (on 3 separate cadavers) were repaired with an angle of 90° between the long axis of the secondary lobe defect and the alar rim. On 2 separate cadavers, 2 defects were repaired with an angle of 135° between the long axis of the secondary lobe defect and the alar rim. All defects were repaired by the same surgeon (C.H.) using similar techniques and similar amounts of undermining. Abbreviation: NA, not applicable (difference between the 90° and 135° groups). a Angle between ala and axis of secondary defect. b Midnostril to ala. c Positive values indicate alar retraction; negative values indicate alar depression. d Paired t test. Using a camera held in a fixed position, standardized profile photographs were taken using a digital camera with a 100mm ultrasonic lens (model EOS D30; Canon USA Inc, Lake Success, New York). Photographs were taken before and after repair with the camera and cadaver heads in the same spatial relationship to each other. Prerepair and postrepair photographs were also taken from the contralateral profile position. Alar retraction was calculated using Adobe Photoshop CS (Santa Clara, California). Alar retraction was defined by drawing a line from the anterior aspect of the nostril to the posterior aspect. A point of maximal retraction was calculated. Figure 2 presents an example of how the measurement was performed on a cadaver before repair. Figure 3 demonstrates the measurement after repair. The 1cm defect was used as a fixed measurable distance to calibrate the measured point of maximal retraction and give a distance in actual millimeters. This also increased the accuracy of standardization of the distance and position between prerepair and postrepair photographs. As shown in the Table, in the 3 cadavers that underwent repair using an angle of 60°, all had alar retraction, with a mean displacement of 1.3 mm. This was not a statistically significant change (P =.07). In the defects that underwent repair using an angle of 90°, 2 of 3 cadaver ala had measured retraction. The other cadaver had a depression of the ala. The mean direction of distortion was cephalad, by 0.1 mm. However, this did not demonstrate statistically significant retraction of the position of the ala (P=.72). In the 2 defects that underwent repair using an angle of 135°, both ala underwent depression by 1.0 mm. When the differences achieved between the different angles were compared, there was a significant difference in measured distortion between the cadavers that had 90° and 60° vector placement (P =.02). There were no measurable changes to the contralateral maximal nostril distance. No standard approach exists for the repair of a nasal defect. Each defect is unique and must be assessed based on its location, size, skin type, and support. The bilobed flap has been a workhorse for small to medium-sized defects ( 1.5 cm). Many techniques have been developed to decrease the probability of alar distortion. This study demonstrates that the angle between the alar rim and long axis of the secondary defect can affect alar distortion. The least amount of alar retraction is achieved with an angle of 90° between the long axis of the alar rim and the long axis of the secondary defect. When analyzing the tension vectors produced by closing the secondary defect, the axis of the tension vector is parallel to the alar rim. Therefore, one would expect that this tension would not cause the ala to be pulled cephalically. Figure 4 demonstrates a design in which the angle between the alar rim and axis of the secondary defect is close to 90°. Figure 5 demonstrates the direction of pull when the secondary defect is closed. The direction of pull (indicated by the arrows) is parallel to the alar rim. Thus, no retraction takes place owing to the tension at the site of the secondary defect. However, a more acute angle is more likely to result in alar retraction. When a more acute angle is used, a tension vector angle is produced that lies in a direction that can potentially pull the alar rim in a cephalad direction. Figure 6 demonstrates a design in which the angle between the alar rim and axis of the secondary defect is close to 60°. Figure 7 demonstrates the direction of pull when the secondary defect is closed. The arrows along the side of the secondary defect demonstrate the direction of pull from the closure of the secondary defect. 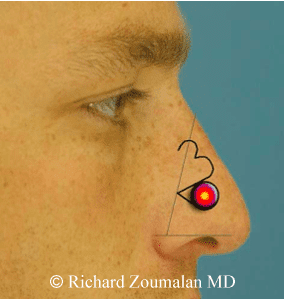 The arrow near the nostril shows the vector component perpendicular to the alar rim that may cause alar retraction. Using an angle larger than 90° between the alar rim and axis of the secondary defect demonstrated alar depression in both cadavers. When the angle becomes more obtuse, there is potential for vectors of the secondary defect to affect the position of the ala.
A prerepair schematic of a template with an angle of 90° between the alar rim and long axis of the secondary defect. A postrepair schematic of a repair using an angle of 90°. The tension vectors due to closure at the secondary defect are parallel to the alar rim. Therefore, no component of the tension from the secondary site should affect the position of the alar rim. The pair of arrows indicates the direction of pull. A prerepair schematic of a repair using a more acute angle. The postrepair schematic of using a more acute angle demonstrates that tension forces have a component that is perpendicular to the alar rim (inferior single arrow). This may act to cause or contribute to alar retraction. The pair of arrows indicates the direction of pull. Individual differences between each cadaver head may have led to different amounts of retraction or depression. Although all defects and repairs had the same dimensions, the cadaver noses were different sizes. There were also noticeable differences in skin thickness and cartilage within the ala. Despite this, the technique was not altered. This study does not account for long-term wound healing dynamics. 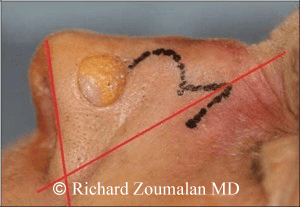 Scar contracture may lead to delayed alar retraction. Scar and flap contracture is an expected process in the healing of any flap. Minimizing the risk of delayed alar contraction due to scar and flap contraction must be prioritized. The vector analysis conducted in this study supports the observation that larger bilobed flaps with more acute angles have more alar retraction. Less initial retraction due to less tension in the cephalad direction may lead to less ultimate alar retraction. It is important to note that there were no measurable changes to the contralateral side in any of the cadavers. We did not use the contralateral side as a control owing to the potential of “interference” from secondary lobe tension factors. 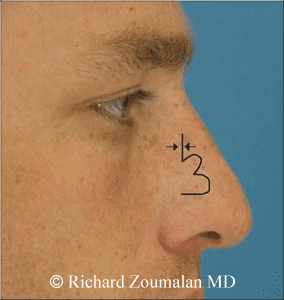 In conclusion, vector alignment can have an impact on nostril displacement. In bilobed flaps, the axis of the secondary defect may play an important role. This study suggests that secondary defects aligned perpendicular to the nostril have the least amount of movement on the cadaver model. Esser JFS. Gestielte lokale Nasenplastik mit Zweizipfligem lappen, Deckung des Sekundaren Defektes vom ersten Zipfel durch den Zweiten. Dtsh Z Chir. 1918; 143:385390. Zitelli JA. 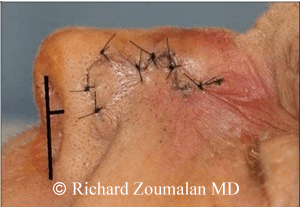 The bilobed flap for nasal reconstruction. Arch Dermatol. 1989;125(7): 957959. Rohrich RJ, Griffin JR, Ansari M, Beran SJ, Potter JK. Nasal reconstruction: beyond aesthetic subunits: a 15year review of 1334 cases. Plast Reconstr Surg. 2004;114(6):14051416. Moy RL, Grossfeld JS, Baum M, Rivlin D, Eremia S. Reconstruction of the nose utilizing a bilobed flap. Int J Dermatol. 1994;33(9):657660. Cho M, Kim DW. Modification of the Zitelli bilobed flap: a comparison of flap dynamics in human cadavers. Arch Facial Plast Surg. 2006;8(6):404409. Zitelli JA. Comments on a modified bilobed flap. Arch Facial Plast Surg. 2006;8(6): 410. Crowley RT, Nickel WO. Definitive treatment of decubitus ulcers in paraplegic patients by coverage with transposition bilobed flap grafts. Surg Gynecol Obstet. 1955;100(4):468472. Cook J, Zitelli JA. 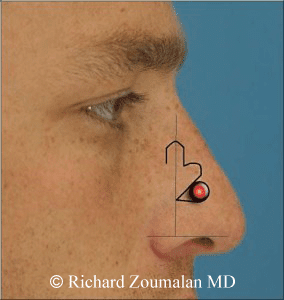 Primary closure for midline defects of the nose: a simple approach for reconstruction. J Am Acad Dermatol. 2000;43(3):508510.